How To Get Above 90 Marks In Chemistry: If you are thinking how to get above 90 marks in Chemistry, you are at the right place. Class 12 CBSE Chemistry is a scoring subject if you prepare properly. NCERT Chemistry book is important and it is recommended that you finish it thoroughly. But to score above 90 marks in CBSE Class 12 Chemistry, you need to solve multiple question papers to get a hang of the kind of questions asked in the exams. It will also help you score higher if you are appearing for JEE Main, JEE Advanced and NEET. In this article, we will give you detailed information about how to get above 90 marks in Chemistry. In order to get 90+ in Chemistry, you must clear your basics first and then master the chapters and concepts that are important for the board exams. Your preparation strategy for CBSE Class 12 Chemistry should be a smart one. You should consider your strengths and weaknesses as well as the chapterwise weightage before creating your Class 12 Chemistry study plan. 1) Students who are weaker in Mathematics and calculation should concentrate more on Organic Chemistry. Chemistry is a scoring subject. According to Chemistry question paper of past few years, it has been seen that all questions are directly or indirectly asked from the NCERT books. So, NCERT books should be read in a proper manner and one should remember it very well that there is no substitute to hard labour. Organic Chemistry carries 18 marks and it is one of the most important units in Chemistry for every student who wants to get better marks in the Chemistry. 2) In Inorganic Chemistry, p-Block Elements and d-Block Elements together constitute 13 marks. Though it a tough ask to mug up both the chapters in a quick time, it would be ideal to study the notes of these chapters. The questions from the inorganic chemistry are directly asked. Students should practice the structures of different chemical compounds of p-block elements properly because they are often asked in the board exam. In summary, inorganic chemistry should be read in discrete manner and regularly. Because irregular study of inorganic chemistry can cost you very much and you may forget even the already learned topic too. 3) The last three chapters like Biomolecules, Polymer and Chemistry in Everyday life should be prepared really well. They together constitute 10 marks and students often dare to take these chapters lightly and it really affects their final marks in Chemistry. These are definitely easy chapters but do not keep if for the last minutes or do not take them lightly. 4) Physical Chemistry should be read in appropriate manner. First of all, each formula from each chapter should be learned. Students should then try to solve related problems based on those formulas. Theory part should also be learned from those chapters as they are often asked in the exam. 5) Try to solve sample paper on every Sunday at least. It will help you in time management and would give you an idea of which question should be attempted first. It will also help you in JEE and NEET. 6) If you tend to forget the topics that you have finished then do not take much stress. It happens with every student. Prepare a time table and take out at least 2 hours daily for revising the topics that you have finished already. A regular revision can help you in securing higher marks in Chemistry. If you feel you are not good at Chemistry, start early. Start reading your NCERT book as soon as possible. Do not try to rush and finish the chapters. You should understand that reading a book that deals with scientific concepts, theory and reactions is different from a novel or a comic. Follow up your NCERT concepts with a reference book to gain a deeper understanding of the topic. Start attending classes and laboratory lectures. Perform each and every laboratory experiment. For example, you might not remember Le Chatelier’s principle of equilibrium for reversible reactions, but if you perform the experiment, and see things happen, chances are, you will remember it for a longer duration. Try and grasp the concepts and always ask questions. Make a list of unanswered questions and ask to discuss them with a teacher or a peer. Do not ignore numerical problems. Most of the times, the problems are the direct application of the formulae in use, and, at times are mixed with your understanding of a topic. The numerical problems, if mastered are a good way to score marks. After you finish your syllabus, revise as many times as possible. When you finish, do take the sample papers provided by CBSE in a timed environment. When you finish, do take the sample papers provided by CBSE in a timed environment.Also, have a look at the answers and the marking scheme provided, as no other source can give you a better judgment than the one provided by CBSE. At Embibe, you can get video links and descriptions of all the concepts in the syllabus of Class 12 Chemistry that explain the concepts in an easily-understandable way. Use the CBSE Class 12 study material to finish the whole syllabus. You can also solve Chemistry practice questions that will help you in you boards as well as engineering and medical entrance exams. 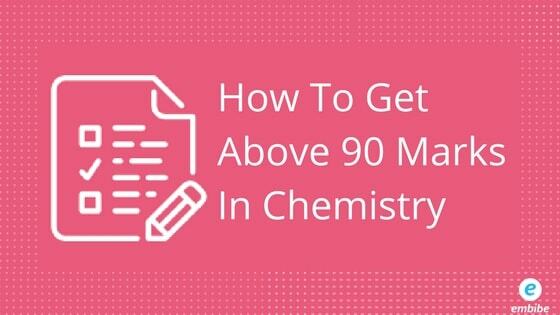 We hope this detailed article on how to get above 90 marks in Chemistry helps you. If you have any query related to how to get above 90 marks in Chemistry, feel free to ask us in the comment section below. We will get back to you.